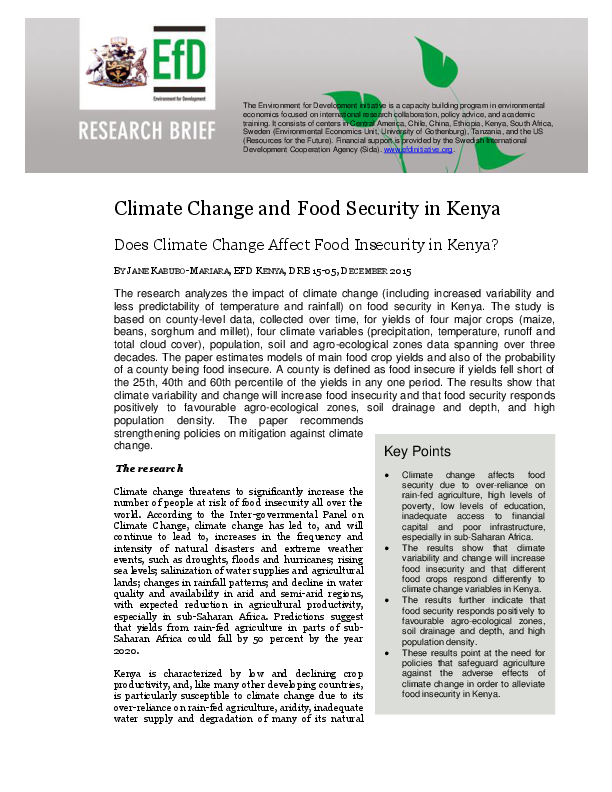 The research analyzes the impact of climate change (including increased variability and less predictability of temperature and rainfall) on food security in Kenya. The study is based on county-level data, collected over time, for yields of four major crops (maize, beans, sorghum and millet), four climate variables (precipitation, temperature, runoff and total cloud cover), population, soil and agro-ecological zones data spanning over three decades. The paper estimates models of main food crop yields and also of the probability of a county being food insecure. A county is defined as food insecure if yields fell short of the 25th, 40th and 60th percentile of the yields in any one period. The results show that climate variability and change will increase food insecurity and that food security responds positively to favourable agro-ecological zones, soil drainage and depth, and high population density. The paper recommends strengthening policies on mitigation against climate change.